Pope Paul VI (Latin: Paulus PP. VI; Italian: Paolo VI), born Giovanni Montini (September 26, 1897 – August 6, 1978), reigned as Pope of the Roman Catholic Church and Sovereign of Vatican City from 1963 to 1978. Ordained as a priest in 1920, he rose through the Roman Catholic Curia succeeding John XXIII, who had convened the Second Vatican Council, he presided over the majority of its sessions and oversaw the implementation of its decrees. Giovanni Battista Enrico Antonio Maria Montini was born in Concesio, in the province of Brescia, Lombardy, into a family of local nobility on his maternal line. He entered the seminary to train to become a Roman Catholic priest in 1916, and was ordained a priest in 1920. He took the solemn oath against Modernism before an open tabernacle initiated by Pope Saint Pius X. He studied at the Gregorian University, the University of Rome and the Accademia dei Nobili Ecclesiastici. His organizational skills led him to a career in the Curia, the papal civil service. He rose to the position of acting secretary for ordinary (non-diplomatic) affairs in 1944. Some of his work during this period remains shrouded in mystery, most notably concerning his involvement in the diplomatic activities of the Vatican during World War II. The unique complexity of the war-time period saw Montini procure large sums of money to aid European Jews, while he is also alleged to have been involved in enabling some leading Nazi officers to escape the collapse of the Third Reich. Formally a simple administrative employee of the Vatican government, but effectively a close supporter of Pius XII, he has often been recognized as one of the most important political figures of the period. In 1954, Montini was appointed by Pope Pius XII to the senior post of Archbishop of Milan. During his period in Milan, Montini was known for his pro-labor policies and developed a reputation as a progressive. Although some viewed him as a person who might have succeeded Pius XII, since Montini was not yet a member of the College of Cardinals he was not a serious candidate at that particular conclave. Instead Angelo Cardinal Roncalli was elected pope and assumed the name Pope John XXIII. After only two months in office, the new pope raised Montini to the position of cardinal-priest of Ss. Silvestro e Martino ai Monti. 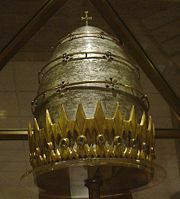 Pope Paul VI's Coronation Tiara, at the Crypt of the Basilica of the National Shrine of the Immaculate Conception in Washington, D.C.
Montini was generally seen as the most likely successor to John XXIII. He was an enthusiastic supporter of the pope's decision to convene the Second Vatican Council. When John died of stomach cancer on June 3, 1963, Montini was elected to the papacy in the following conclave and took the name Paul VI. He brought Vatican II to completion in 1965 and directed the implementation of its goals, which included the largest revision to the church's liturgy since the Council of Trent, held 400 years prior to Vatican II). He was also the last pope to date to be crowned; his successor Pope John Paul I replaced the papal coronation—which Paul had already substantially modified, but which he left mandatory in his 1975 apostolic constitution Romano Pontifici Eligendo—with a papal inauguration. In 1968 he discontinued most of the ceremonial functions of the old Roman nobility at the papal court, save for the Prince Assistants to the Papal Throne. He also abolished the Palatine Guard and the Noble Guard, leaving the Swiss Guard as the sole military order of the Vatican. In 1965 he established the Synod of Bishops, but nevertheless reserved certain pronouncements to papal authority alone, including priestly celibacy and contraception, both of which became the subject of controversial encyclicals, Sacerdotalis Caelibatus and Humanae Vitae respectively. To the world Pope Paul VI is perhaps best known for his encyclical Humanæ Vitæ (subtitled On the Regulation of Birth), published on July 25 1968. In this encyclical he reaffirmed the Catholic Church's traditional condemnation of artificial birth control. A commission composed of bishops, theologians and laity had been established by John XXIII for the purpose of reviewing the teaching on birth control. In the furor surrounding the publication of the encyclical, stories appeared in the press that it was the commission's majority recommendation that the Church relax its stance on contraception. Paul VI reportedly chose to discount the so-called "majority report" when he promulgated Humanæ Vitæ. The controversies over these two pronouncements tended to overshadow the final years of Paul VI's pontificate. However, he remained firm in his conviction and unambiguously reaffirmed and expanded on both teachings with an additional encyclical titled Evangelium Vitae, as well as in a series of 129 talks delivered at his weekly audiences. 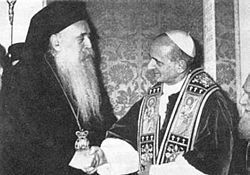 Patriarch Athenagoras I and Pope Paul VI in Jerusalem in 1964. Paul was the first pope in centuries to meet the heads of various Eastern Orthodox faiths. Notably, his meeting with Ecumenical Patriarch Athenagoras I in 1964 in Jerusalem led to rescinding the 1054 excommunications of the Great Schism. This was a significant step towards restoring communion between Rome and Constantinople. It produced the Catholic-Orthodox Joint declaration of 1965, which was read out on December 7, 1965, simultaneously at a public meeting of the Second Vatican Council in Rome and at a special ceremony in Istanbul. The declaration did not resolve the 1054 schism, but showed a desire for greater reconciliation between the two churches. Paul VI also became the second pope to meet an Anglican Archbishop of Canterbury, Michael Ramsey, after the visit of Archbishop Geoffrey Fisher to Pope John XXIII on December 2, 1960. He described the Anglican Church as "our beloved sister Church." Along with Archbishop Ramsey, he encouraged the foundation of the Anglican Centre in Rome. Paul VI also became the first pope to visit six continents, and was the most traveled pope in history to that time, earning the nickname the Pilgrim Pope. This trend has been continued by successors. In 1970, he was the target of an assassination attempt at Manila International Airport in the Philippines. The assailant, a Bolivian Surrealist painter named Benjamín Mendoza y Amor Flores, lunged toward Pope Paul with a kris, but was subdued. According to some critics, Pope Paul VI was habitually indecisive. For example he appeared unable to decide how to deal with the scandal-ridden American Cardinal Cody, who was surrounded by allegations of financial and sexual impropriety. Cody remained in office until his death. Some critics point to Paul's response to Archbishop Lefebvre, who challenged papal authority by refusing to accept the New Mass and liturgical reforms produced after Vatican II. The pope summoned Lefebvre to meetings in which he argued with Lefebvre and showed his great frustration, but he did not excommunicate the rebellious archbishop, as many had expected. Lefebvre was eventually excommunicated "automatically" (latae sententiae) for his illicit episcopal ordinations in 1988 during the reign of Pope John Paul II. The pope's response to the critics of Humanae Vitae is also cited as an example of indecisiveness. When Cardinal O'Boyle, the archbishop of Washington, D.C., disciplined several priests for publicly dissenting from this teaching, the pope gave him encouragement. But when other bishops did nothing to quell dissent, the pope raised no objection. And when bishops in Canada, France, Sweden, and the Netherlands were lukewarm in their support or even publicly expressed reservations about this teaching, the pope did not discipline them in any way. Some of Pope Paul's statements in the 1970s seemed critical of the direction taken by the Church after Vatican II, expressing his dislike of some of the "pedestrian" language used in some translations of the New Mass. However, he did not generally indicate such unhappiness in his public statements. He did oppose Liberation Theology after the 1962–1965 Vatican Council, frowning on the Latin American Episcopal Conference's support of the Marxist-inspired doctrinal movement. According to some sources, as Paul became older he spoke of abdicating the papal throne and going into retirement. Some critics see this as another example of indecision, as he remained in the papacy until his death. It is rumored that Pope John XXIII referred to then-Cardinal Montini as "Our Hamlet" (Amleto), in reference to his indecisiveness. The private secretaries of both popes have denied that John ever made such a statement. Up to and including the current Pope Benedict XVI, all of Paul VI's successors as pope were created cardinals by him. His immediate successor, Albino Cardinal Luciani, who took the name John Paul I, was created a cardinal in the consistory of March 5, 1973. After John Paul I's 33 day reign, Karol Cardinal Wojtyla, created a cardinal in the consistory of June 26, 1967, took the name John Paul II. After the third longest reign in history, John Paul II died on April 2, 2005. On April 19, 2005, Joseph Cardinal Ratzinger was elected to the papacy and took the name Benedict XVI. Ratzinger was created a cardinal in the small four-appointment consistory of June 27, 1977, which would be Paul VI's last consistory before his death in August 1978. Paul VI left the Vatican to go to the papal summer residence, Castel Gandolfo, for the final time on July 14, 1978, uncertain of whether he would return. While mass was being said for him near his bedside during the afternoon of August 6, the feast of the Transfiguration, he became agitated—an episode later diagnosed as a heart attack—but managed to receive communion one last time. He then fell into unconsciousness for four hours and died soon after. Paul VI is buried beneath the floor of Saint Peter's Basilica with the other popes. In his will, he requested to be buried in the "true earth" and therefore, he does not have an ornate sarcophagus but an in-ground grave, according to his wishes. Pope Paul VI was a major figure in the modern history of the Roman Catholic papacy. Reviled by traditionalists for implementing the reforms of the Second Vatican Council, he was also a lightning rod for liberals for failing to modernize Church teaching on priestly celibacy, birth control, and the ordination of women. He increased the Catholic Church's awareness of the need for international development with his encyclical on the Progress of People and traveled extensively as the first "Pilgrim Pope," encouraging the growth of an indigenous Church, particularly in Africa and Asia. The 143 cardinals he personally created (appointed) as pope are perhaps his most lasting legacy along with his outreach to the Orthodox Church. His meetings with the heads of various Eastern Orthodox faiths and especially with Ecumenical Patriarch Athenagoras I made a significant mark towards restoring communion between Rome and Constantinople. The diocesan process for beatification of Paul VI was begun on May 11, 1993 by Pope John Paul II. He was given the title of Servant of God as the first of four steps toward possible canonization. At the same time, it must be recognized that there is far less popular enthusiasm for Paul's canonization than for that of either John XXIII and John Paul II. ↑ See for example, the brief overview: What is the theology of the body? www.christopherwest.com Retrieved 2 March 2006. For the text see General Audiences : John Paul II's Theology of the Body, Pope John Paul II. www.ewtn.com Retrieved 6 May 2006. ↑ Apostle Endangered. TIME December 7, 1970. Retrieved April 13, 2007. Hebblethwaite, Peter. Paul VI: The First Modern Pope. Paulist Press, 1993. ISBN 978-0809104611. 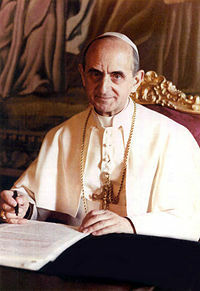 Pope Paul VI. Our name is Peter: An anthology of key teachings of Pope Paul VI. Franciscan Herald Press, 1977. ISBN 978-0819906663. Stransky, Thomas F. (Editor), Sheerin, John B. (Editor). Paulist Press, 1981. Doing the Truth in Charity: Statements of Popes Paul VI, John Paul I, John Paul II and the Secretariat for Promoting Christian Unity (Ecumenical Documents I, 1982). ISBN 978-0809123988. The Book of the Gospels: The Roman Missal Restored by Decree of the Second Ecumenical Council of the Vatican and Promulgated by Authority of Pope Paul VI and Revised by Order. Liturgical Press, 2000. ISBN 978-0814625729. This page was last modified on 30 January 2019, at 17:40.